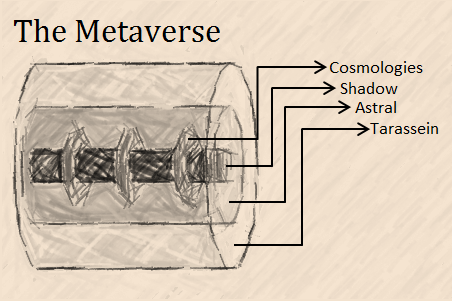 The Metaverse is a multiverse cosmology designed to allow for crossovers between various fantasy campaign settings, as well as allow for a variety of methods of traversing the planes including fantasy space adventures, portals and planeshifting. The Metaverse has three fundamental planes: the Plane of Shadow, the Astral Plane, and Tarassein. These can be imagined to exist as concentric cylinders with the Plane of Shadow on the inside, the Astral Plane in the Middle and Tarassein on the outside. The Plane of Shadow is a lot like our real world space. In its deepest regions, it bears some resemblance to our world’s space. This Deep Shadow, as it is called, can be traversed using a specially equipped skysailing vessel, and used to reach completely different cosmologies with their own planes, gods and mortal worlds. The region where the Plane of Shadow borders these alternate cosmologies is known as the Border Shadow, a region which starts to take on the traits of the plane it border. Surrounding the Plane of Shadow is the Astral Plane, an impossible infinite plane. If the Plane of Shadow connects the “matter” of the multiverse, then the Astral Plane connects the “ideals” of the multiverse. Many outer planes and divine realms are accessible from the Astral plane, which can be traversed with powerful magic, portals, or (again) with special skysailing vessels. Encompassing the whole of what has been mentioned before is Tarassein, a realm barely understood, and indeed impossible to understand for rational minds. It is a realm of chaos, and it is the source of many aberrations in the multiverse, including the tarotic aboleths. Some sages speculate that is like a disease on the fabric of reality, others worry that it is actually the worlds of humanoids and outsiders that are the disease, and Tarassein is just an immune response, a buffer, between a larger, more fundamenal, and more insane reality beyond. Perception Filters and Legacy Filters: Gods who desire to keep their worlds separate from the multiverse sometimes use perception filters and legacy filters. Perceptions filters stop people from noticing anything too outside their experience. (For example, skysailing ships will almost be invisible to people who don’t realize they are on a planet floating in the void.) Legacy filters stop major changes to a celestial sphere caused by beings not native to a plane being from being permanent. (For example, a fleet of skysailing vessels which destroyed a planet with a legacy filter would leave the celestial sphere and return only to find that the planet was never destroyed.) In general, only tiny changes and occasional outside contact are permitted by gods who use such methods. Magic Is Variable: Magic that works one way in one celestial sphere can work a completely different way elsewhere in the multiverse. This is one thing stopping many celestial spheres from becoming part of a highly magical, powerful and expansionist planar empire. There are a few options for travelling the planes. Expensive rituals can be used to plane shift. Otherwise, the most common form of planar travel is skysailing. Astral Keels allow a ship to move quickly through the void and the Astral plane. They cost 28,000 gp. Levistone or artificial levistone is around 10,000 gp, but only functions in Domonormia. Sails of Skysailing are made from phase spider silk and go from 25,000-100,000 depending on size and quality.